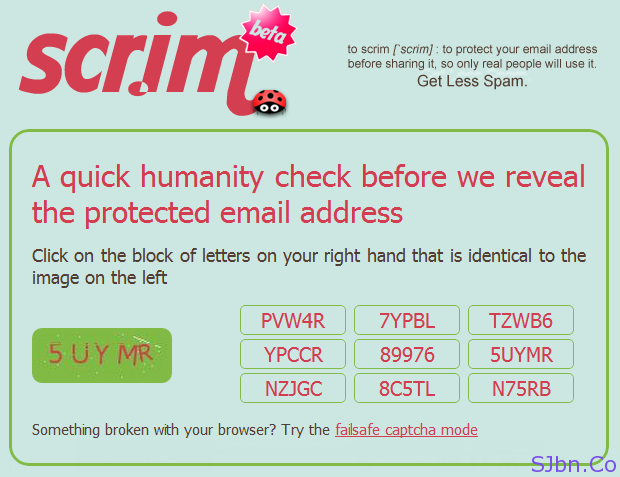 Today in this post I will tell you how you can protect your email address from spam bots. When you normally type your email address to give someone it is in next and easily readable by bots especially when you share it on social networking websites like Twitter and facebook. But scr.im is an online service that lets you share your email address with anyone but also while keeping it protected from spam bots. Simply go to scr.im, enter your email address, get your short URL and share that URL with anyone and anywhere you want. Now when someone will visit that URL they will be asked to verify, to check if they are a human or not, after they verified then only it will show your email address, otherwise it will not. In case if you want to change the given email address in it you can go to scr.im/edit/[keyword], follow the instruction and change your email address in that URL. For instance this is your URL scr.im/SJbn , in this SJbn is the keyword now put SJbn just after the scr.im/edit/ and it will look like this scr.im/edit/SJbn. And if you want your email address to get removed from that URL, just use this URL scr.im/remove/[keyword], in this will also [keyword] will be replace as we did above for edit and this is how it will look scr.im/remove/SJbn. If you have any question or problem let me know.